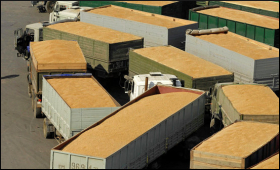 The government on Tuesday imposed 10 percent import duty on wheat and tur dal (arhar) with immediate effect. The move is aimed at protecting farmers' interest in the wake of bumper harvest this year. Arjun Ram Meghwal, Minister of State for Finance, informed Lok Sabha that amendments were made in a notification to impose basic customs duty of 10 percent on wheat and tur with immediate effect. In December last year, the government had scrapped the 10 percent import duty on wheat amid rising domestic prices and concerns of a dip in buffer stocks following two consecutive drought years. As per the government's second advanced estimates, the production of wheat is estimated at 96.64 million tonnes this year, which is higher than the previous record production of 95.85 million tonnes in 2013-14. Tur dal production is estimated to be 4.23 million tonnes this year.